Trash management is essential for creating and upholding a positive, attractive site image and atmosphere. 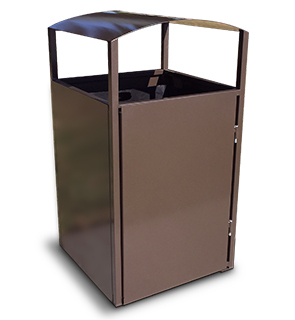 The 32 gallon, square Table Mountain Trash Receptacle is an essential solution to effortlessly improve outdoor areas. The modest design of the all steel Table Mountain Receptacle features 8" disposal opening on all 4 sides of the unit and an attached rain canopy, to help prevent the collection of precipitation in the liner. Servicing and maintaining the receptacle is made easy, a convenient hinged door allows fast access to the removable black ridged liner. 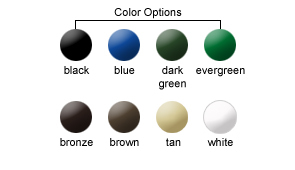 The durable steel receptacle is primed and powder-coated to provide optimal weathering resistance.